On Sunday night when Red Sox pitcher Ryan Dempster plunked New York Yankee Alex Rodriguez in the back, it took about a nanosecond for the Fenway faithful to tweet their approval or outrage (depending on their allegiance.) But those in the park relied on relatively new cellular connections to do so. The future Fenway Park will offer Wi-Fi to fans to accomplish the same thing. To be clear, Fenway has Wi-Fi now, said Red Sox IT Director Steve Conley, but most of that capacity is soaked up by “back of office stuff” — the press boxes, in-seat services, and the ticket gates. “It’s a tricky proposition but every stadium will be a hotspot. It’s just a matter of when and how easy it will be,” Conley said in an interview. Two years ago, the Red Sox installed Verizon’s(s vz) distributed antenna system (DAS) technology to accommodate all those smartphone tweeters in the stands but even putting in that gear — and the Meru Networks routers for Wi-Fi — was a challenge for a ballpark that is on the National Register of Historic Places. Conley has likened finding spots for all these connectivity points to an Easter egg hunt and if you’ve ever been to the crooked interior warrens of the park, you know what he means. “With these things we just put them in a NEMA box and paint ’em green, and find a place for them,” Conley said. The Red Sox IT problem is not unique. Many companies are in older buildings, constrained by their own walls and their environs. Face it, even if the Red Sox did want to expand Fenway, the Mass Pike and Brookline Avenue bordering the walls are fairly immoveable objects. Given that limitation, the smart use of existing real estate for IT is very important. 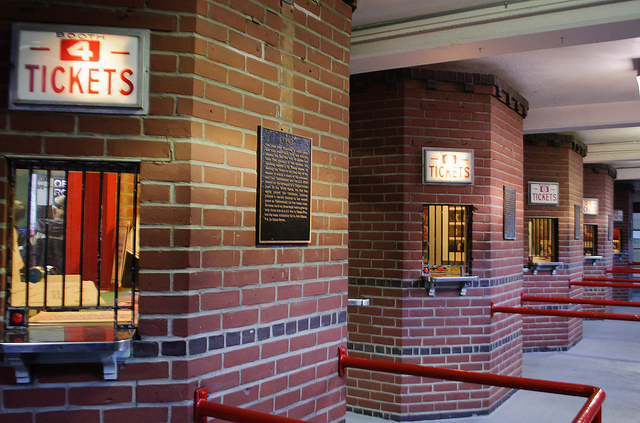 That was apparent back in 2007 and 2008 when the Red Sox computer room sat behind the ticket office. “We were renovating and our need for technology kept growing [but] it was clear we didn’t have adequate power or cooling — this is a 100-year-old building,” Conley said. Something had to give. So they looked at alternatives for their IT build-out. And, even though Conley was a “self-described server hugger” who really did not want to put any IT off premises, it was pretty clear that had to happen. After checking out co-lo and data centers in and near Boston, the Red Sox decided to go with the Markley Group, with its shiny, expansive facilities atop the old Jordan Marsh (now Macy’s) store a few miles away in Downtown Crossing. “They blew us away. There was no way we could come close to what they provide so my reluctance went away pretty quickly after researching the project and assessing the costs,” Conley said. The Red Sox still run that old computer server room and some on-premises applications — Microsoft Dynamics GP (Great Plains) CRM and EMC(s emc) Syncplicity for advanced scouting video but most core services run out of Markley. As of now, the team isn’t using Markley’s new cloud-based services, but that’s always an option going forward, Conley said. Another benefit of going with Markley, or another peering center, is that all the major telcos and pipes are there already, making for easy and fast interconnection to a variety of services. The team also outsources a bunch of its other big workloads — Major League Baseball Advanced Media handles all its web-site related stuff and Tickets.com the ticket sales. That means those spiky workloads are handled by someone else. But when it comes to dealing with internal IT in a sometimes fluky and creaky building packed — on its good days with 37,000-plus screaming Red Sox fans eager to vent electronically — internal IT still carries the load, as Conley knows only too well. Markley Group’s Boston data center facility. Would love more info about the Wi-Fi network with Meru who has pretty unique single channel system. How many APâ€™s what ratio of 5Ghz to 2.4Ghz. Also what a shame that the Sox sold out to just Verizon for the DAS system as if they did it themselves and made it multicarrier friendly they could have allowed Sprint, ATT, T-Mobile and other carriers access to the ballparks DAS system and made reoccurring monthly revenue instead of taking the easy way and only allowing Verizon customers access to decent cellular coverage. Good writeup. The need to bring sports teams into today’s tech became far more important when everyone started carrying computers in their pockets and connecting in so many ways. We’re coming into the age of the social fan, connected in or out of the game, in the off season or not. Social media is amazingly good at connecting passion…the Red Sox clearly get that. Any way you slice it, 1912 was in the 20th century. Ha! you are right my friend. Fixing my mistake. Thanks for noting.